The Canadair CF-5 (officially designated the CF-116 Freedom Fighter) was the Canadair licensed-built version of the American Northrop F-5 Freedom Fighter aircraft primarily for the Canadian Forces. The CF-5 was upgraded periodically throughout its service career in Canada. The Canadian Forces retired the type in 1995, although CF-5s continued to be used by other countries into the early 21st century. The CF-5 was ordered by the Royal Canadian Air Force, which became part of the Canadian Forces on 1 February 1968. The new unified force took delivery of the first CF-5s (it was almost universally referred to as the CF-5 except in official documentation) at the end of 1968. Total production by Canadair for Canadian Forces was 89 single-seat aircraft and 46 dual-seat aircraft, but many were also built for the Netherlands and Norway as well, some surplus aircraft were sold to Venezuela. Originally designed by Northrop as a low-cost, low-maintenance fighter jet, the F-5 was intended for use by air forces that had limited resources and technical expertise to maintain a sophisticated aircraft. For Canada, which had an extensive aerospace industry, selection of the F-5 was seen as a step backwards and soon received the derisive RCAF nicknames, "Tinkertoy" or the "Supersonic Tinkertoy." Selected originally to provide a tactical support role based in Canada, the CF-5 was also committed to NATO's northern flank to act a rapid-deployment force. However, the role for the CF-5 throughout its service with the RCAF was changed frequently and eventually, the diminutive fighter would serve as a light attack strike fighter, reconnaissance platform and trainer. The Canadian version had several modifications to make it more suitable to operating in Canadian Forces theaters. In order to address complaints about long take-off runs, the Canadair version featured a two-position nose landing gear; compressed it operated like the original, but extended (before takeoff) it raised the nose and thereby increased the angle of attack and increased lift. The system reduced takeoff distance by almost 20%. A mid-air refueling probe was installed, Orenda built General Electric J85-15 engines with 4,300 lbf (19 kN) thrust were used, and a more sophisticated navigation system was added. The nose of the CF-5 was also interchangeable with a specially designed reconnaissance set with four cameras in it. Over the course of its life, it received many upgrades to its avionics and capabilities. Initially 433 squadron and 434 squadron were the only two squadrons to operate the CF-5. It was intended that three squadrons would fly the aircraft, but due to budgetary restrictions, the excess aircraft were put into storage in CFB North Bay and CFB Trenton, some later being sold to other countries. 434 squadron was assigned to do lead-in tactical fighter training for the CF-104, but was transitioned to the role of a rapid reaction squadron, being ready to deploy to Europe at a moment's notice in the event of hostilities. The squadron moved to CFB Bagotville with 433 squadron, for a short time, and then on to CFB Chatham. The training role was adopted by 419 Squadron in CFB Cold Lake; it would continue to provide jet training, dissimilar air combat training (wearing quasi-Soviet "aggressor" paint schemes similar to USAF, USN and USMC F-5Es), and serve as a lead-in fighter trainer for the CF-18 until the aircraft was retired in 1995. All remaining airframes were put into storage at CFB Mountainview. CF-5A : Single-seat fighter version for the Canadian Forces, designation CF-116A. 89 built. 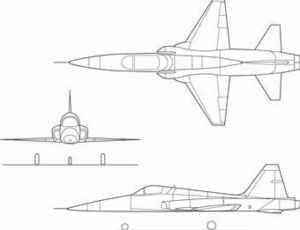 CF-5A(R) : Single-seat reconnaissance version for the Canadian Forces. Built in small numbers. Canadian Forces designation CF-116A(R). CF-5D : Two-seat training version for the Canadian Forces, CF-116D. 46 built. NF-5A : Single-seat fighter version for the Royal Netherlands Air Force. 75 built. NF-5B : Two-seat training version for the Royal Netherlands Air Force. 30 built. VF-5A : Single-seat fighter version for the Venezuelan Air Force. VF-5D : Two-seat training version for the Venezuelan Air Force. McIntyre, Bob. Canadair CF-5 (Canadian Profile: Aircraft No. 4). Ottawa, Ontario: Sabre Model Supplies Ltd., 1985. ISBN 0-920375-02-2. Stachiw, Anthony L. Canadair CF-5 Freedom Fighter (Canadian Service Aircraft No.1). St. Catharine's, Ontario: Vanwell Publishing, 2003. ISBN 1-55125-073-X. It uses material from the Wikipedia article "Canadair CF-5". This page was last edited on 22 September 2009, at 21:55.